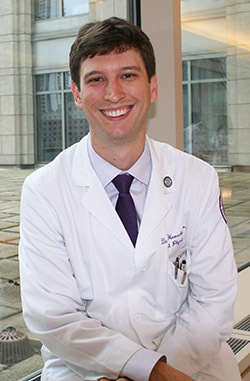 As a recipient of the L. Randol Barker Award, Bruce Henschen, ’12 MD, resident in Internal Medicine, will present his abstract, “Educational and Clinical Impact of the Education Centered Medical Home” at Johns Hopkins University in November. Bruce Henschen, ’12 MD, resident in Internal Medicine, has been selected to receive the L. Randol Barker Award, awarded by the Johns Hopkins University Division of General Internal Medicine, for his research on the clinical and educational impact of the Education Centered Medical Home (ECMH). Dr. Henschen will present of the abstract, “Educational and Clinical Impact the Education Centered Medical Home (ECMH)” at Johns Hopkins in November, where he will be presented the award, given annually by the Johns Hopkins University General Internal Medicine Housestaff Research Awards Review Committee. As one of the students who participated in the pilot program of ECMH in 2011, Dr. Henschen has continued his involvement in the program as a resident. At each ECMH site students attend clinics to see patients and serve as peer educators and health coaches during their four years of medical school. The voluntary clerkship provides students with continuity with patients, peers and preceptors, differentiating itself from the traditional model allowing students to serve as patient advocates and act as educators. To assess the educational and clinical impact of the ECMH, Dr. Henschen and his team conducted a survey of students and patients. They found that students were impacted positively by the curriculum, and the patients who attended the clinic had a greater frequency of contacts with the clinic as well as improved markers of preventive care, such as cancer screening and flu shots. The Housestaff General Internal Medicine Research Awards program, now in its ninth year, gives out five awards annually to researchers chosen from across the country. Each award is named for an internationally-regarded mentor and researcher at Johns Hopkins whose primary faculty appointment is in the Division of General Internal Medicine. The L. Randol Barker Award recognizes research achievement in medical education: L. Randol Barker, MD, professor of Medicine and co-director of the Johns Hopkins Faculty Development Program in Teaching Skills, is recognized for his work in how learning occurs in clinical medicine and in the professionalism of the educator-learner relationship.